Lightly sweet and bursting with almond flavor, these almond raspberry cake bites can be whipped up by hand using just a whisk and a single bowl. Too late. We’ve already eaten seven. 1. Preheat the oven to 375°F. Line a baking sheet with parchment paper. 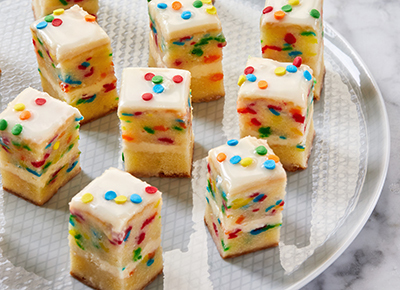 Arrange 20 to 25 spoons on the baking sheet so they have at least ¼ inch between them. Lightly grease the bowls of the spoons with nonstick spray. 2. In a medium bowl, whisk together the oil, sugar, egg white, yogurt, vanilla extract and almond extract. 3. Add the flour, almond flour, baking powder and salt; mix to combine. Use a spoon to scoop the batter into the bowls of the spoons, filling them about three-quarters full (1 to 2 teaspoons). 4. Press a raspberry into the center of the batter in each spoon. Bake until the cakes puff up around the raspberry and appear set, 12 to 15 minutes. Cool completely. Garnish with confectioners’ sugar just before serving.